Pretty soon we will have some new additions on the farm. Our new Dexter cow, Pearl, and her little steer calf will be taking up residence in our barn within the next couple weeks. I am just so stinkin' excited, and we have been very busy making sure everything is ready for her. We still have a few things to finish, but for the most part we are done! We started by purchasing some high quality alfalfa bales. I plan to feed her about 10 to 15 lbs. per day of alfalfa, along with some free choice prairie hay. The alfalfa provides additional protein which a pregnant milk cow needs. The hay is stored in what was a lean-to, but is now a hay shed. A conveniently placed door opens into the milking stall area. This location is perfect because she will receive the alfalfa while I am milking her. The barn itself is a work in progress. It has a dirt floor, and desperately needs to be cleaned out. We still have some very old manure to shovel out and haul to the compost pile. You can see the manure pile by the gate to the stall. Eventually we would like to concrete the entire thing and add a tack/grain room. 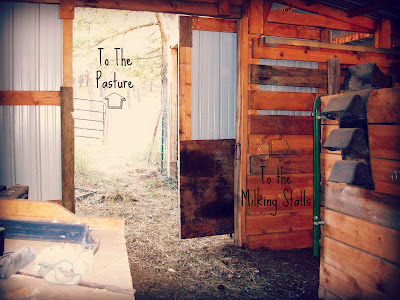 The stall (which currently has a table saw, folding chair, and some other random items taking up space) leads to the corrals and pasture and to the milking stalls. 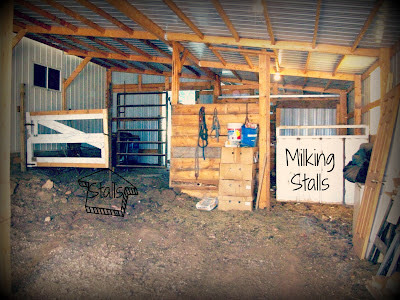 Welcome to the milking stalls. You might want to click on the picture for a better look. I'm not sure what originally called this home, but it was something tall. Taller than your average horse. A draft horse maybe? Anyway, we are going to lower the feed bin and shorten the length of the divider so I have room to milk. 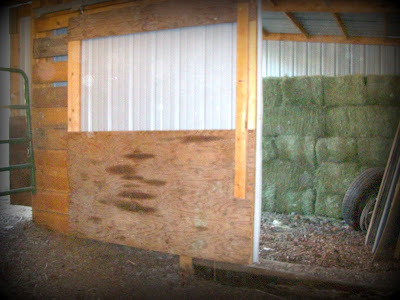 There aren't any head stalls, and we don't plan to add any unless we need them. Pearl is very tame, and very well trained. She lets her current owners just walk up and start milking, so hopefully she will show me the same consideration. Last, but certainly not least, is the corral area. This area still needs a lot of work, but will work for now. We need to repair the round pen, or rather rebuild it. We also need to finish the smaller holding pens. However, our to-do list for the farm is long, and these things can wait. I hope that Pearl and son (I can't remember his name) like it here. Since Dexters can live upwards of 20 years, Pearl will be here for awhile. I hope you enjoyed the barn tour! I've nominated you for the Liebster Award! Check out my post at ladybugsabode.wordpress.com . I'm excited for you! How fun. I look forward to pictures of your Pearl.